5'1 is the new 6'2: The Body Shop® Advent Calendar - 24 Days of Joy - Day's 8 - 14! The Body Shop® Advent Calendar - 24 Days of Joy - Day's 8 - 14! Lot's of vitamin E products in days 8 - 14 but I'm quite the happy Bunny about this as I'm a HUGE fan of The Body Shop's vitamin E range! I've been particularity happy with these days as each item is fabulous! Smells amazing, feels amazing against the skin, matches the explanation perfectly, literally just a thicker version of shower gels, but I think it being a cream meant I felt more moisturised after washing. I have combination skin so I was concerned that it wouldn't be the best mask for my skin type but it actually works really well. I was a bit skeptical about the idea of a sink in mask - but that made me love it more! After using it my skin felt soft and supple. A DEFINITE repurchase! 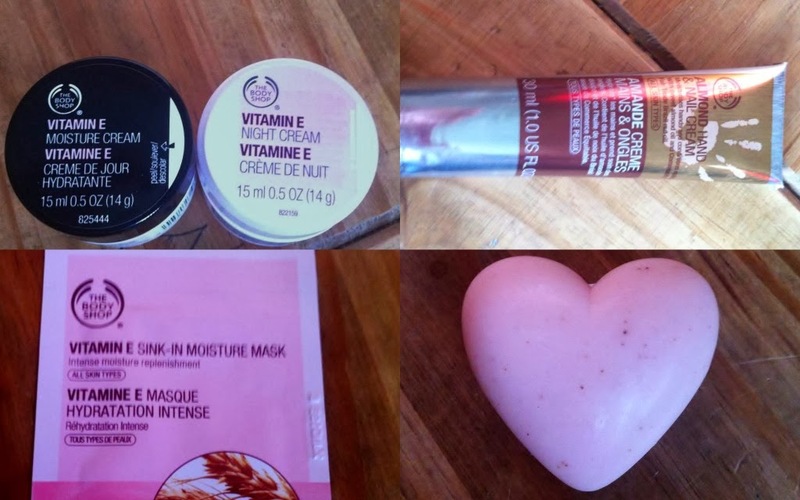 I know it's for all over the face, but I loved using around my eyes and forehead - It's really helped revitalise my skin. It's light and smells gorgeous. It's a true keeper! Of course the night cream followed, which has helped my skin heal overnight and feel great in the morning! Now, I'm a fussy cow with what get's put on my hands, where scent is concerned, but this has made itself the exception as it's done wonders on my nail beds with conditioning. I had cancer as a kid and my hands when through a lot, anything that'll help is a repurchase to me! OMG this is AMAZINGLY LOVELY! I'm one of those nutters who indulges far too much in Cranberries and in soap it's no exception. This was a joy to use - so fruity, fresh and exfoliating! What more could I want from a lovely lil soap! Between the scent and the feel this felt so high-end and luxurious! It has a mix between a fruity and floral scent and incredibly lightweight - yet lasts all day, giving it that high-end feel. If I'm to have a favourite out of these it would be this! Days 8 - 14 are all certainly going to be repurchases when they run out - I've simply fallen in love with them all - especially day 14! These seven days have been amazing and has made me even more excited to open each day! Eek only a day to go and one more post on these bad boys to finish off this mini series! What do you think these products? Have you tried and fallen in love with them like me? I'm so jealous! I wish I brought it! I bet this was so exciting to open :) I must get a beauty advent calender next year!